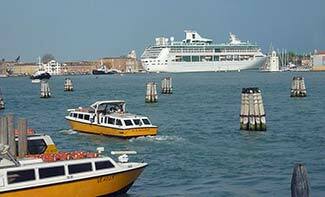 ABOVE: A cruise ship takes visitors away from Venice. Venice isn't one of those places that you can see once and forget before you die. If you're like us, you'll become hooked on Venice, and you'll want to spend more time in the city with each passing year. "If...playing at being Venetian sounds like so much Cinderella-crazed girlish nonsense, consider some of the toughies who have thoroughly indulged their own fantasies: Lord Byron, Friedrich Nietzsche, Robert Browning, Ernest Hemingway, Ezra Pound. And if they all seem to be wild romantics, not to mention disgracefully self-dramatizing show-offs, here is the confession of someone [Henry James] not exactly known for the expression of unfettered personal passions: 'I adore it--have fallen deeply and desperately in love with it.'" Don't get us, Judith Martin, or the late Henry James wrong: We aren't suggesting that Venice is perfect. Too many neighborhood stores have been replaced by mask shops or souvenir stands, the summers are hot and humid, and acqua alta--the tidal flooding that can inundate low-lying areas of the city for several hours at a time--is a frequent nuisance from late fall until early spring. Young people must go to Mestre or Verona for pop concerts, and Venice's football club (which last won the Italian Cup in 1940) has declared bankruptcy twice in recent years. "For all of its grandeur, it is built to the human scale. While the tangle of streets, alleys, and canals forms a maze that can confuse even old-timers, the city is small enough to be comprehensible. You will get lost, but it will be in places that are familar and welcoming." Another virtue (if one ignores pickpockets) is the fact that, in Martin's words, "Venice is startlingly crime-free....The experience of taking an urban walk at night, finding oneself in a dark passage, and suddenly hearing the echoes of a stranger's footsteps approaching from behind is disorienting in Venice, because all it heralds is the arrival of a matron carrying home a pastry box by its ribbons, and pleasantly open to being of help if you have lost your way." By now, it should be clear that Venice is an addictive pleasure, but one that needn't require months in rehab. If you're like many visitors to Venice, you won't need us to tell you that failing to come back is a painful mistake--and a sin that you should make every effort to avoid.